State Song "Hail! South Dakota"
Mount Rushmore: Massive mountainside sculpture depicting four former United States presidents, located in Keystone, South Dakota. Badlands National Park: National park located in southwestern South Dakota. Crazy Horse Memorial: Monument in Crazy Horse, South Dakota. Custer State Park: State park in Custer, South Dakota. Sylvan Lake: Lake in East Custer, South Dakota. Corn Palace: Multi-purpose arena in Mitchell, South Dakota. Wind Cave National Park: National park located in southwestern South Dakota. Reptile Gardens: Wild animal park in Rapid City, South Dakota. Black Hills National Forest: National forest on the border of South Dakota and Wyoming. Washington Pavilion: Art gallery and science museum in Sioux Falls, South Dakota. Bear Country USA: Drive-through wildlife park in Rapid City, South Dakota. Harney Peak: The highest natural point in South Dakota, located in the Black Hills National Forest in southern Pennington County. Falls Park: Public park in Sioux Falls, South Dakota. Great Plains Zoo: Zoo in Sioux Falls, South Dakota. Terry Peak: Ski area in Lead, South Dakota. Spearfish Canyon: Gorge in Spearfish, South Dakota. Bullock Hotel: Historic hotel in Deadwood, South Dakota. Dakota is the Sioux word for "friend" or "ally." 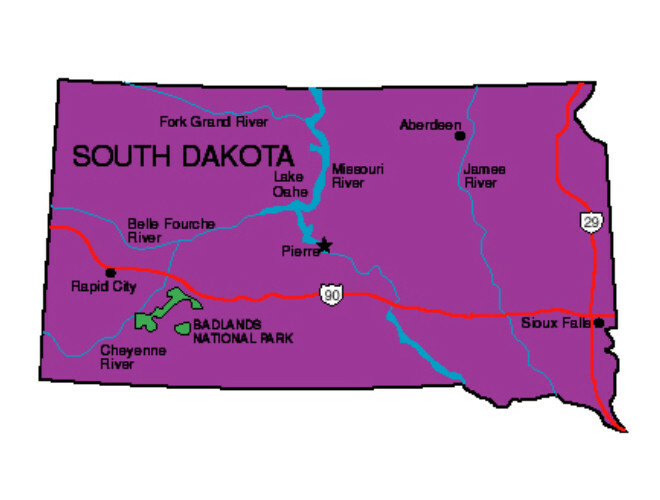 The Dakota Territory was divided into South Dakota and North Dakota on November 2, 1889. The most famous point of interest in South Dakota is the Mount Rushmore National Memorial, located in Pennington County. It opened on October 31, 1941. 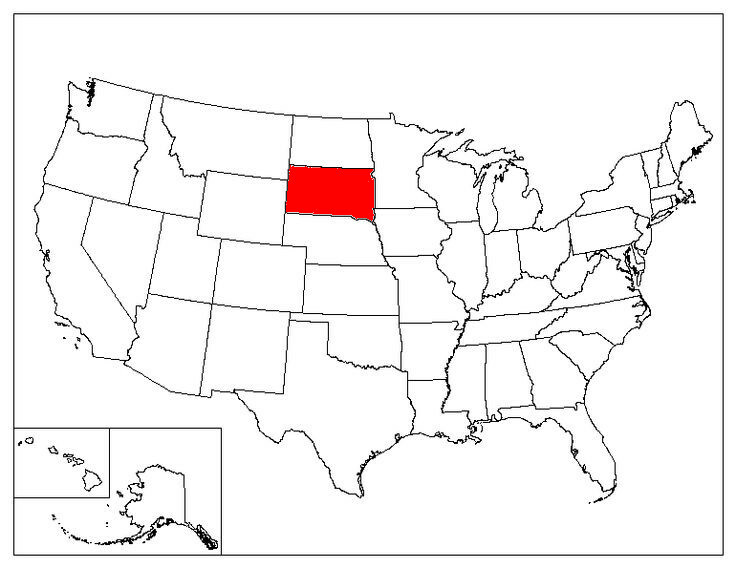 South Dakota is the only state whose name does not share a single letter with that of its capital (Pierre). Jewel Cave in Custer County, South Dakota, is the second largest cave system in the United States, and third largest in the world. This cave system contains 181.89 miles of mapped passageways. The largest and best-preserved Tyrannosaurus Rex fossil in the world was discovered by Sue Hendrickson near Faith, South Dakota, in 1990. The fossil was named�Sue�in Sue Hendrickson�s honor. The geographical center of the United States is approximately 20 miles north of Belle Fourche, South Dakota. Mitchell, South Dakota, is the home of the world's only Corn Palace. South Dakota is the only state with an official State Jewelry: Black Hills gold. Lemmon, South Dakota, has the world's largest Petrified Wood Park.